Tune in to the world around you. A rich background of music & sound. I used to spend most days with music on ‘in the background’ as I painted, wrote papers, drove in my car, worked in the yard, prepared food….the list goes on and on. Anywhere within range of the speaker volume was filled with sound. When I lived in Brooklyn during graduate school, I curated playlists for walking on the streets and riding public transportation; sound to pass the time and headphones to create a protective barrier between myself and unsolicited street interactions. It never felt dysfunctional. It never felt like an escape or like sensory overload. I loved singing along to favorite songs, finding just the right mood by changing the music. Music was an important part of my daily life. The background of my life’s painting was varied and punctuated with bright color and swirling sounds. Silence torn, ripped, and in need of soothing. when did I lower the volume? When did I press STOP? Working in a large forensic mental health hospital, I was surrounded by sound ‘in the background’ of daily life. Sounds of yelling, of red-flashing alarms, of footsteps pounding across the floor in a show of force. Sounds of the various gates and doors slamming metal against metal. Sounds of the metal detectors. And the more insidious, internally-felt sounds: imagined cries of those involved in the crimes the patients committed, the low buzz of hatred and violence, the palpable sound of pain — not often spoken but ever-present. My car at the end of a day was a refuge. My quiet apartment and the wide-open night sky served as necessary refreshment before the next day of work. I learned the value of restorative silence while working 40 hours a week in an cacophonous environment. Silence as a window to beauty. 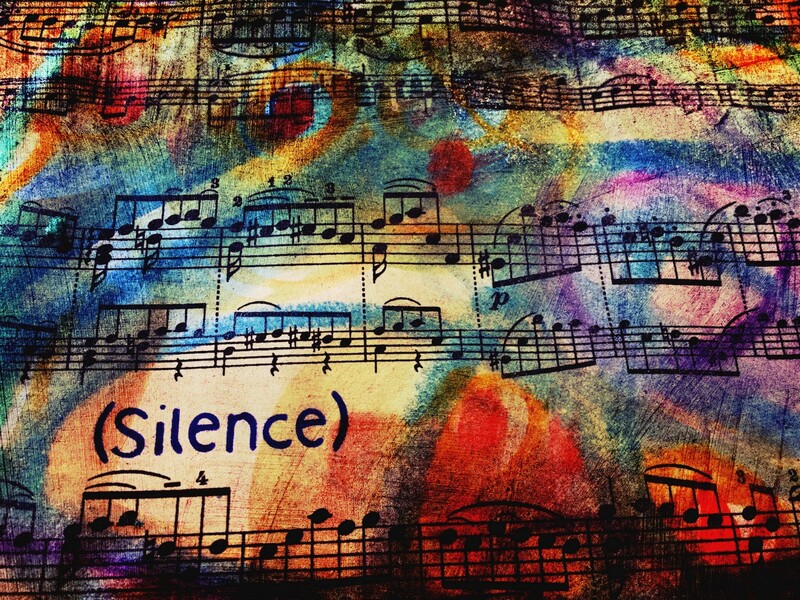 In my next job, working as an art therapist with older adults, I learned about silence as a place of comfort and ease. I do not play music during art sessions, to ensure those with hearing loss are able to communicate. I also find that while music is a wonderful approach for interacting with elders with dementia, it can be a distraction or overstimulating for some. When we create silently together we learn to listen more attentively to eye-contact, touch, and the gentle beauty of being with. Sitting bedside with a woman in the last days of her life, we talked through her life, we created a few drawings, but we spent most of the time quietly breathing — the space between words or movements as a way for her to say goodbye. I find that we do not need constant sound. We do not need constant flurries of stimulation. We need more space for presence. Silence is a luxury. I am aware of my privilege — being able to go outside in the early morning and hear only owls hooting and wind in the trees. I watch the moon set and the sun rise. I can choose when to paint my life background with music and when to be in a still, quiet place. I want to be clear: I am not condemning music! I share these experiences as a way to consider how silence and stillness may be forms of music, of background, of life-texture. As time passes, I cherish the silence more. I protect it, for myself and for the older adults I work with. Shared silence is a gift we can give each other, and to ourselves. When we can be present and comfortable in silence, we listen to the things that really matter. How are you filling the background of your life? Where might there be opportunity to turn down the volume in order to be in silence — to be in relationship with yourself, with your breath, and with your community? Making space for silence and stillness.